Your child's First Holy Communion is one of the most solemn and significant days in his or her life. And there is no better way to mark this special occasion than with My First Communion Bible, new from Saint Benedict Press. Foreword by Father Benedict Groeschel, C.F.R. Following Father's letter, 26 Bible stories from the New Testament will help children come to know and love Jesus even more. Each story is beautifully illustrated in a manner that will inspire young readers and bring the Bible stories to life. 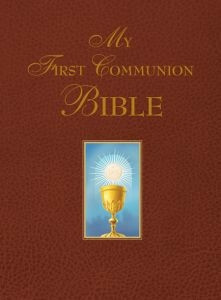 My First Communion Bible is the perfect gift for First Communicants from parents, godparents, pastors, or any special person in their life -- and the perfect way to encourage children's love for the Lord, present in the Holy Eucharist.